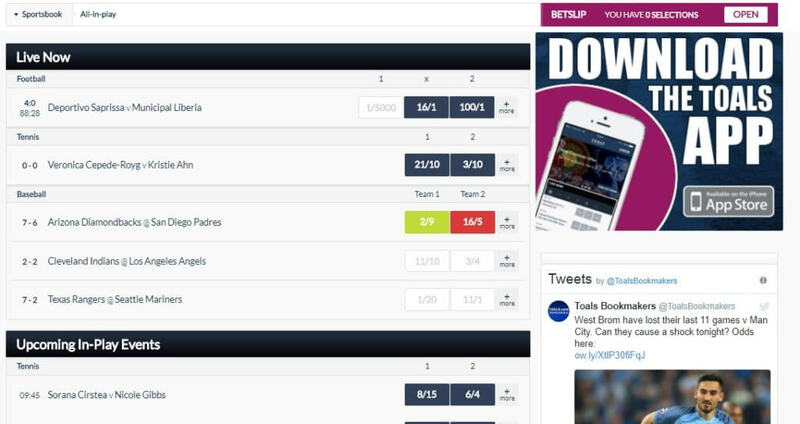 Toals Bookmaker first made a name for itself serving Northern Irish punters in Toals Bookie shops with locations across the country, but they have now expanded to the online market. The site is excited to offer a new welcome bonus with a Toals coupon code which gives users the opportunity to have the odds doubled on their first bet! The Toals Online Sportsbook provides bettors with a wide range of sports and leagues that should be able to cater to any betting requirements. The site also incentivises bettors by giving a variety of bonuses and promotions for them to get the most value on their money. 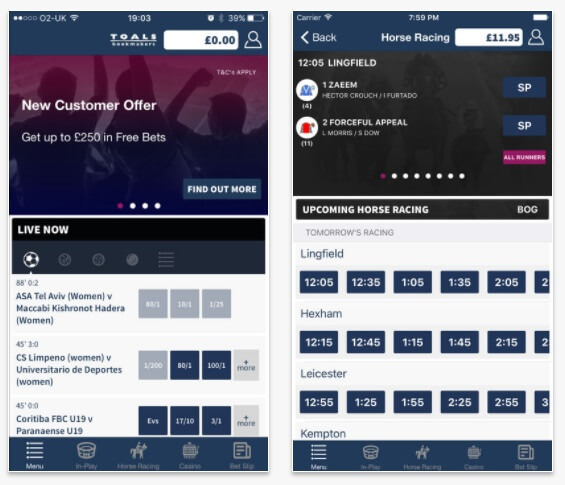 The site can be accessed both via a browser-based client on your PC or mobile device, and through the Toals Bookmaker mobile app. For players who like to take a break from the betting action and dabble in online casino games, a fully functional online casino is also available at Toals. The Toals welcome bonus gives new users the chance to win double money than they would on their first bet. The enhanced winnings will become available to the player as free bets, which they can use at their leisure. Regular part of the winnings is, of course, paid in cash, without any additional requirements for withdrawal. A qualifying wager is any first bet made at Toals between €5 and €10 at odds of 6.0 or lower (minimum 2.0). Only single wagers are eligible. Multiples and special bets (like Lucky 15, 31, 63, etc.) are excluded. Click on the link above to begin the activation process! Users will be required to create a Toals betting account. Only new users to the site will qualify to activate the bonus. New users may be required to fill in a Toals coupon code when registering on the site. If a Toals coupon code is required, the users must type it into the ‘Coupon Code’ field in the registration form. To qualify for the welcome bonus, you need to make a first bet of minimum €5 and maximum €10. The odds for the qualifying bet must be between 2.0 (EVS) and 6.0 (5.1). These odds must be achieved via a single bet. Multiple bets on the same slip will make it ineligible for the offer. The regular winnings are paid in withdrawable cash, while the enhanced winnings are paid as €10 free bets. If you stake €10 at odds of 6.0 and win, you will receive €60 in cash and €50 in 5 free bets. Free bets must be wagered in full and expire 72 hours after they are credited. Visit the Toals website using an updated browser of your choice and click on the ‘Sign Up’ button found at the top of the homepage. You will be transported to a registration form. Fill the form with your personal details such as your full name, date of birth and mobile phone number and create a unique username and password to login to your account. If you have a Toals coupon code you may enter it into the ‘Coupon Code’ field in the form. A Toals coupon code will not be required for this promotion. Tick the terms and conditions box and click on the ‘Join Now’ button to complete the registration process. You may be required to validate your account via e-mail after you have completed the registration process. To do this visit the Inbox of the e-mail address provided in the form and click on the validation link in the body of the e-mail sent by Toals. You must now make a deposit into your Toals betting account. You may do this by visiting the cashier and using any of the convenient deposit methods. The Toals Sportsbook can be accessed both through a browser-based client and a mobile application. The browser-based client is compatible with both PC and mobile, with a special customized mobile site available by simply using your mobile browser to visit the Toals site. The Toals mobile app can be acquired on iOS devices by visiting the iTunes stores. Unfortunately an Android app is yet to be released by Toals. The mobile app has the same functionalities as the browser-based client with mobile login, mobile cashier and live betting all accessible. A superfast Touch ID login and intuitive live scoreboards are also available for users on the Toals Mobile App. Toals provides users with a simple, easy-to-navigate client. Both the browser-based client and mobile application ensure that users have no trouble finding their favorite sports and placing their bets. The browser-based client offers a main menu bar with all the most popular sports at Toals as well as a quick tab to live betting. Users may click on the ‘ALL SPORTS’ button to access a list of all the sports available at Toals. To switch between the Toals Sportsbook and the Toals Casino users may click on the corresponding tabs that can be found at the top of all pages. Quick links to daily football coupons and all of the most popular betting markets at Toals can be found directly on the homepage. Promotions can be accessed by clicking on the ‘Sportsbook Promotions’ button at the top of the site. There you can find out if there is a Toals coupon code waiting for you. Placing a bet at Toals is easy with the simple betting slip format used. All users will be required to do is click on the odds of the sporting events they would like to place a wager on and the bet will appear on a betting slip to the right. Users may then type in the amount they would like to bet in the ‘STAKE’ field and click on the ‘Place Bet’ button to complete the bet. If a user would like to place a parlay or accumulator bet they may click on each of the bets they would like to parlay and type their stake in the corresponding field eg. double, treble, etc. Past bets can be viewed in the betting history section of the site under results. Users may choose the type of odds format they would like their bets displayed in on the site by clicking on the ‘FRACTIONAL or ‘DECIMAL’ button found at the bottom of all pages. 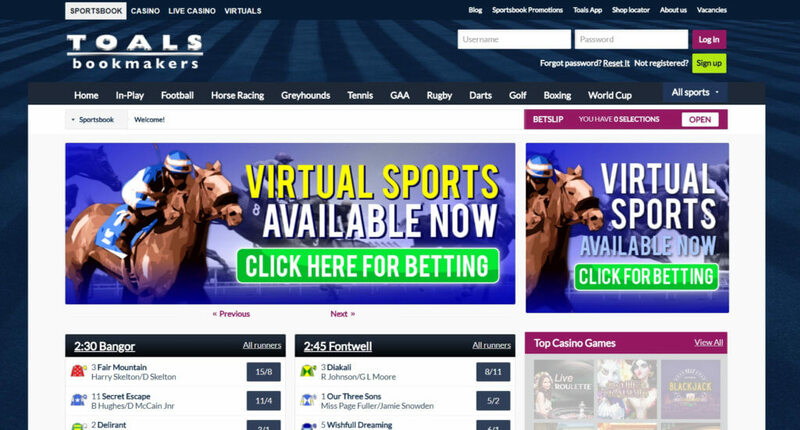 Toals provides users with all of the top sports and leagues in the Irish region ensuring Irish punters have a site which caters to their specific bets. Football in particular is very well represented at Toals, with dozens of leagues from all over the world available for betting. Top leagues such as Bundesliga, Brasileiro Series A, La Liga, the English Premier League and the UEFA Champions League are all available for wagering at Toals. American Leagues are also available at Toals including the NBA, NHL, MLB, MLS and the NFL. Niche sports such as Darts, eSports, Handball and GAA Football are also well represented on the site, ensuring users have the ability to bet on all their favorite sports regardless to their popularity. American Football, Australian Rules, Baseball, Basketball, Boxing/MMA, Cricket, Cycling, Darts, Football, GAA Football, GAA Hurling, Golf, Greyhounds, Handball, Horse Racing, Ice Hockey, Irish Lotto, Motor Sports, Pool Rugby League, Rugby Union, Snooker, Specials, Tennis, Volleyball. Football is the most bet on sport at Toals. As a result users are given a HUGE selection of football leagues and betting markets to choose from, with special attention given to UK and Irish Leagues. Some of the popular leagues that can be found at Toals are the Bundesliga, La Liga, the English Premier League, the Brasilerio Series A, the UEFA Champions League and Italy Series A just to name a few. Each league can be wagered on both with individual matches or with the outright league winner. Live Betting has come to be one of the most popular football sports betting options. User may wager on the match as it takes place on special betting markets which are not available before the match begins, such as the next team to score a goal or the next team to receive a yellow card. Most popular football matches will be available at Toals for live betting, however to make sure you aren’t disappointed, visit the ‘In-play’ section. Handicaps – football bettors may create their own handicap or bet on a handicap set by Toals by allowing a number of goals to the advantage or disadvantage of a team through a +/- system. For example, a user may give Team A + 2 goals to begin the match. In this case the odds on Team B will greatly increase. The odds will fluctuate depending on how many goals a team is afforded or handicapped. Goals Over/Under – over/under bets are very popular among football bettors. They give bettors the chance to wager on whether they believe the total goals in a match will go over or under a specific number of goals. For example, if Toals sets the over/under at 3.5 goals if both teams score 3 or less goals the under would win and 4 or more goals, the over would win. 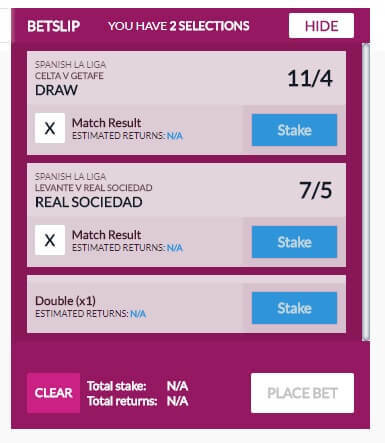 Double Chance – double chance bets give users the opportunity to bet on two outcomes of a match with the same bet. For instance, a user may bet on the Home Team and a Draw or the Away Team and a Draw. The odds will be reduced in a double chance bet but they are great for keeping users safe from draws. Half Time – half time bets allow users to bet on who will win the first half of a football match. The end result of the match will be on no consequence to the bet, if a team wins the first half and loses the match the bet will still be paid out. Football Coupons – football coupons give football bettors the opportunity to place bets on a bunch of their favorite football matches with favorable odds. A football coupon will provide a series of football matches which a bettor may choose from, creating an accumulator bet that has the potential to pay off big. A number of football coupons are available at Toals, some of the most popular are: Today’s Matches, Euro Coupon, UK Coupon, Goals Galore – Both Teams To Score Coupon, Goals Galore Plus – Match Result, BTTS Coupon and the Toals Weekend Football Coupon. ACCA Insurance – ACCA Insurance activates when a user places a five-fold or more accumulator bet of odds valued greater than 5/1 or 6.0. If the bet loses in this case, the user will be refunded the money lost in the bet as a free bet. Only one leg of the accumulator bet can be a losing bet. The free bet given to the user will have a maximum value of €25. Horse racing is extremely popular among Irish bettors, and Toals is no exception. Daily races give bettors the chance to bet on dozens of races each day. Races are not limited to Irish and UK bets, races from all over the world are available to be on at Toals. Outright bets are available throughout the year on popular racing championships such as the Epsom Oaks, Epsom Derby, Cheltenham Gold Cup, Champion Hurdle, Prix de l’Arc de Triomphe, 2000 Guineas, Stayers’ Hurdle and the Ayr Gold Cup. The setup of the Toals site gives bettors access to the next possible race available as soon as a user enters the Horse Betting Section. Bettors may create a betting card for a mixture of races by simply clicking on the horses they would like to wager on. Live betting during the races is not possible, however Toals will be taking bets right up until the starting bell. Horse racing results can be viewed in the betting history section of your Toals account. Horse Racing Best Odds Guarantee – wagers on all UK or Irish horse races will be given the best price on any horse picked. So if the starting price (SP) odds are higher than the odds a bettor received when placing the bet, the higher SP odds will automatically be given to the bettor. Rugby is another one of the popular sports at Toals. Rugby is divided into Rugby League and Rugby Union. Top leagues from both versions of the game are available for betting such as the English Premiership, European Champions Cup, Guinness Pro14, New Zealand Mitre Cup, Rugby World Cup, and Six Nations for Rugby Union. Handicaps – in both Rugby League and Rugby Union users may set a handicap for a team. Setting a handicap is done by using a +/- points system to give a team a lead or a deficit before the match even begins. So for example a +5 bet on the Home Team will give the bettor a five point advantage leading into the match, thus if the team loses by 4 points or less the bettor would still win. The odds for handicap bets are based on the number of points afforded to a team. Winning Margin – for winning margin wagers, bettors may guess what the exact winning margin of the match will be. For example a bettor may wager that the Away team will win by 10-15 points. Winning margin bets are much higher in odds than standard straight bets as the probability of picking a correct winning margin is less likely than just picking a winner. Over/Under Points – over/under bets allow bettors to wager on if they think the total points scored by both teams in the match will be over or under a certain threshold figure. The figure is set by Toals. Toals Sportsbook users are consistently provided with interesting promotions on both seasonal and long-term basis. Most of the promotions give user free bets or provide insurance on select bets. In some cases a Toals coupon code or Toals bonus code will be required to activate the promotional offer. To keep track of all the promotions and Toals coupon codes available, visit the ‘Sportsbook Promotions’ page. Live betting is one of the key selling points of the Toals online sportsbook. The site offers thousands of live bets daily, giving users the option of betting on sporting events as they occur. The main advantage of live betting is the ability of bettors to assess the conditions and state of the game before placing their bet. The odds on live bets at Toals will be fluctuating constantly to reflect the state of the match. Users may place wager at any time but must act quickly to get the desired odds, as the odds change quickly. At Toals football and rugby in particular provide users with the most amount of live betting options. For football, users may wager on the over and under of goals for a half, or the next team to score a goal. Similarly for rugby users may pick the next team to score a try or the winner of the first and the second half of the match. Live Betting can be accessed using the Toals Mobile app, ensuring that users may place wagers on sporting events as they watch them regardless to where they may be. It should be noted that not every match will be supported on the live betting platform at Toals. Users may view a schedule of all upcoming live betting fixtures in the ‘Live Betting’ section. To access the ‘Live Betting’ section simply click on the ‘In-Play’ button found on the main menu bar at Toals. A unique feature of Toals is the ability to play online casino games to go along with the sports betting. Toals offers users a wide selection of casino games from top online gaming software manufacturers giving users the best of both worlds. Slots, Blackjack, Roulette and Video Poker are all available at the Toals Casino with a special section even reserved for table games with live dealers. This live part of the casino gives users the chance to play Roulette, BlackJack, Casino Hold ‘Em and Baccarat with a live-in person dealer on a live stream, just like at a land-based casino. Slots is currently the most popular online casino gaming category with hundreds of video, classic and jackpot slots for users to pick from. The jackpot slots in particular are very popular, giving users the opportunity to win millions of Euros with just one spin on slot titles such as Mega Moolah and Mega Moolah ISIS. Roulette and BlackJack can be played in different variations of the games such as Hi-Lo BlackJack, Perfect Pair BlackJack, European Roulette and Multi-Wheel Roulette. Classic Video Poker titles are also available like Double Double Bonus, Aces and Faces, Jacks or Better and Deuces Wild. A few secure and convenient payment methods are available at Toals to ensure users have no issues getting money on and off the site. Most deposit methods will fund a user’s account instantaneously and most withdrawal methods will take between 3-10 days for the money to actualize. Customer service is at the utmost importance at Toals, with a bunch options to contact the Toals customer support team available at the site. Existing account holders, can login to their Toals betting accounts using their login details and send any query they have to the support team via the “Contact Us” page. The ‘Contact Us’ button can be found at the bottom of every page at Toals in the footer. Alternatively users may visit the Toals bookmaker Facebook page and attempt to contact the support staff through messaging. Toals bookmaker is one of the best and largest Irish-based bookmakers available at the moment. Toals has branched out from its original shop structure to a robust website filled with thousands of sports bets and promotional incentives for avid bettors. The site can be accessed both via browser-based clients or mobile app on any iOS device. The added bonus of the Toals Online Casino gives casino games fans the chance to take a break from the betting action and play their favorite casino games, all from the same Toals betting account. Don’t forget that if you register now at Toals you can take part in the welcome bonus. The welcome bonus gives you an opportunity to double the winnings from your first bet! All users will be required to do is place appropriate first bet, and if they win, they will receive their winnings at double the odds. If you wish to learn more about some other bookmaker in Ireland, we recommend that you visit Paddy Power, Betfair, or William Hill.